Keep balanced. As we grow spiritually we attract prosperity to grow richer and serve better. This innovative workshop recently designed by Master Choa Kok Sui uses a revolutionary approach for the success and financial prosperity of businesses giving a modern and friendly image to management. By using energy and spiritual laws, the realization of plans and projects and overall implementation of labor relations can be made easier. A positive organizational environment, increased worker productivity and good return on investment can be created. Through the use of simple meditation techniques, individuals will develop a sharp mind, increasing their capacity to make accurate decisions and take care of critical business situations. The spiritual empowerment of individuals results in strength, confidence, clarity of goals and dynamism to handle business situations. Hear about techniques used to bridge the gap between management and the workforce, gain mutual respect, develop stronger relationships, enhance efficiency and increase productivity. The workshop is practical and well structured. While the core teachings are based on ancient spiritual and esoteric principles, its concise, innovative and effective approach to corporate management is tailored and made relevant for the modern world. *Have a healther, happier and wealthier flowing energy at home and office environment through right energy direction and management. It is the Science and Art of Environmental Energy Mastery. True Directional Feng Shui: Know the actual origination points on the compass of Prosperity Energies and Spiritual Energies. Avoid negative energies that cause bad luck. Open the correct pathways in your home and office to allow fresh prosperous energies to come in and nourish you. Having the wrong openings means inviting disaster and misfortune. True Form Feng Shui: Energy, chi or prana has definite characteristics that follow the pathways given to it. Opening the correct pathway is like opening the right door for good energy to come it. Esoteric Feng Shui through Thought Power: The key link in making Feng Shui immediately usable. This one secret technique is going to be divulged by Master Choa Kok Sui to integrate as well as quickly materialize the benefits of Feng Shui. Psychological Feng Shui will help your children do better in school by positioning your child’s bed and reading desk to highly energize his/her intellectual faculties. It will allow executives to make better decisions. Marriages will also benefit by positioning the bed to love-enhancing positions. Also know which paintings and pictures to hang on your walls to magnetize positive energies. For thousands of years the knowledge of the place has been a great part of people’s lives and its significance has been passed on to generations through culture and literature. Just as the quality of water is important to the life of the fish, the energetic environment around us determines the quality of our physical, emotional, spiritual and even financial life. Pranic Feng Shui enables us to attract and enhance the quality of our life using the universal principles of energy. It is based on the principle of Prana, Chi or Vitality. Pranic Feng Shui is in fact a technology that teaches how to increase energies of success, good health, happiness, prosperity and spirituality through Geomancy or using the energy field of the Earth. 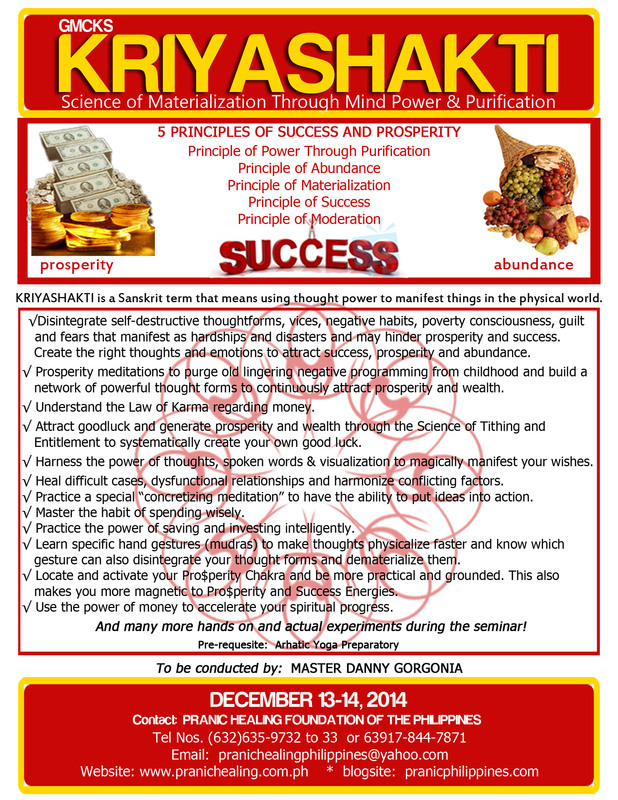 Know the properties of directions and use the proper direction for prosperity and abundance. Use the proper direction to increase the spiritual energy of your house. Understand the effects of certain forms, objects and room formations on the energy of the place. Use proper pictures to bring joy, success and abundance to your home and work place. Use special mirrors to increase the prosperity energies of your place. Know the influences of colors on your system and the proper use of colors based on the function of each place. Know the solutions to neutralize a bad Feng Shui. Pranic Feng Shui Workshop is designed for people who are interested in designing their house or work place to be in complete harmony with nature and to bring health, wealth, happiness and spirituality. It is highly recommended for architects, interior designers and artists, as well as businessmen, retailors and anyone renovating, renting or buying a house or office. 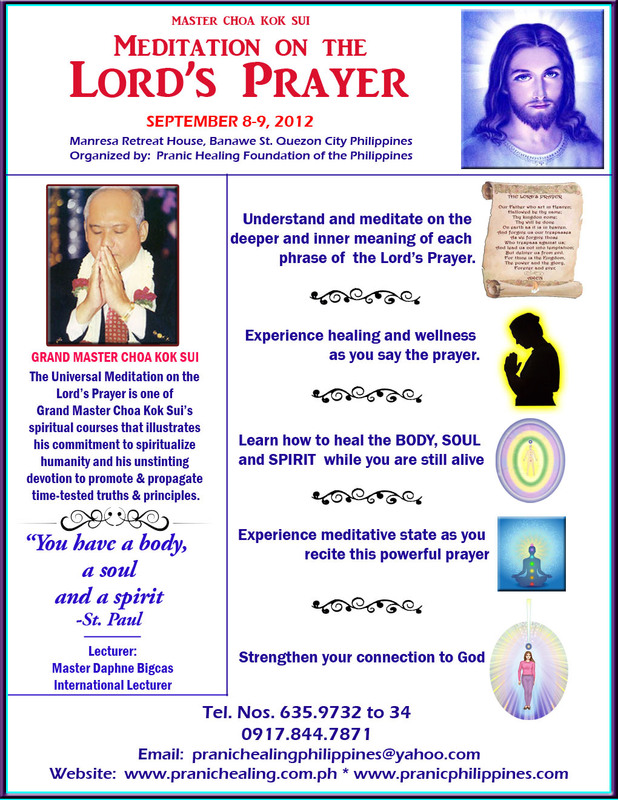 Physical, emotional, mental and spiritual rejuvenation guaranteed! at ICLA-Claret Compound Quezon City Philippines. 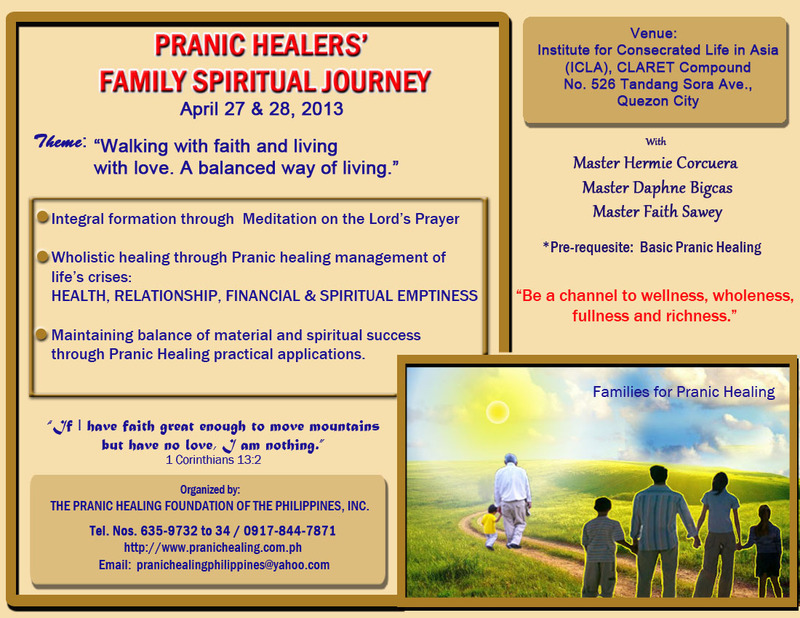 THE PRANIC HEALING FOUNDATION OF THE PHILIPPINES, INC. The power is in you! I'm interested! Send me updates!